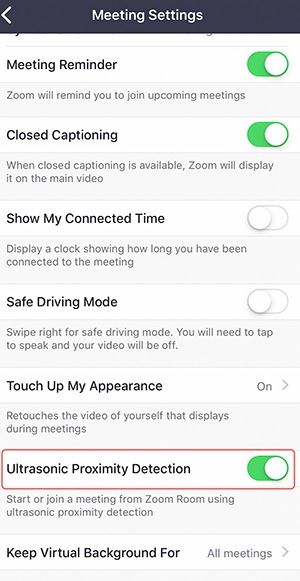 You can use the Zoom iOS app to join a scheduled meeting from a nearby Zoom Room. Your personal account and Zoom Room must be on the same Zoom account. 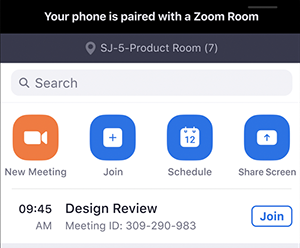 Sign in to Zoom client on desktop or mobile and schedule a meeting. Open the Zoom mobile app on iOS. Tap Meeting and enable Ultrasonic Proximity Detection. 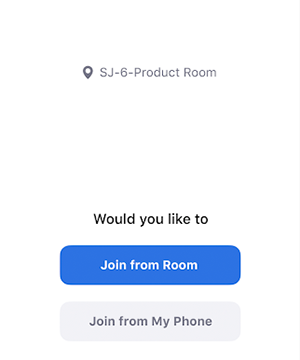 When you are close to an available Zoom Room, a notification will appear showing the room name. Tap Join beside your meeting topic. Tap Join from Room to join the meeting from the nearby Zoom Room.